Heather Glen at Ardenwoods: Comfortable. Secure. Worry Free. Heather Glen Assisted Living allows you to live independently while also offering personalized attention to your health needs. 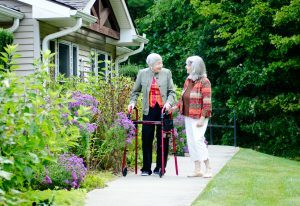 A part of Ardenwoods CCRC, Heather Glen is an active, 48-residence community with services that include round the clock assistance with bathing, grooming and dressing, and medication management. Heather Glen’s Health Services team is led by a registered nurse partnered with physicians, residents, and families for a truly personalized approach whether for short or long-term care. Our comfortable, caring community also provides a full schedule of social, cultural, and recreational programs. Click the button below to read about the services and amenities offered at Heather Glen.